Is it a swim? Is it a road race? Or is it a run? As any triathlete will tell you, their polyvalent sport is the ultimate competition. And having been raised the son of one of these Ironmen, I've certainly had my fair chance to appreciate the challenges of the discipline. Or not. For all the prodding, encouragement, helpful advice and free-flow of equipment had a rather counterproductive effect: Throughout my youth, I preferred to defy the family’s head athlete by avoiding anything close to endurance sports, and seek refuge in fringe disciplines instead. Time and again, I was taken along to some race or another, but in a semi-intentional indifference towards efforts involved, I chiefly took these days as occasions to hang out in some random town, spending hours munching away at pastry breakfasts, pasta lunches and bratwurst dinners, while occasionally strolling back to the racetrack to see my dad come around by one means of locomotion or another. When the day was done and the finish line was reached, I was ready to ask if we could please go to the water park the next day. 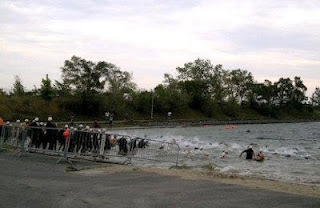 It was somewhat of a surprise, then, that I found my name on the start list for a triathlon this year – even if merely as the swimmer in a relay team. And yet it seemed sensible, especially in comparison to the challenge the colleagues in their forties had thrown us 30-somethings. They wanted us to take them on in the bold, but nonsensical Spartan Races, which seem to consist of nothing but crop tops and mud-crawling. Not yet in our mid-life crises, we smugly decided to go for the real deal instead. As I stripped down to my swimming trunks on race day, and faced the stormy gusts which made the waves in Montréal’s olympic rowing basin carry white crests, the idea suddenly seemed foolish. I found myself surrounded by a crowd of athletic, wetsuit-clad and distinctively serious-looking racers performing their warm-up routines. With the Ironman distance competitors long off, wasn’t this supposed to be the just-for-fun group? Not if the behavior in the first few minutes of the race are anything to go by. As we jostled for position in the water, I was pushed, pulled, grabbed and kicked by my fellow sportsmen. Between dodging them and the waves, it was quite a departure from the pool I had practiced in. Mercifully, I eventually found my space and rhythm, and as I plowed my way towards the transition zone, I tried to recall when exactly I had last participated in an athletic competition. It may have been that 1995 ski school race, when I outdid a group of Dutch kids for the top spot. This time around, I was satisfied to have beaten at least some of the über-athletes to the transition zone, where I passed the baton to the biker on our team. By the time he completed his laps and passed it off to the runner, I had showered, regained my composure and developed an appetite for bratwurst. That unfortunately went unfulfilled, but the taste of competition may yet be one I could grow fond of.